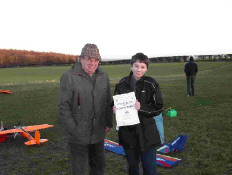 May I congratulate Paul Dack our youngest member on passing his 'A' certificate on Sunday the 30th November. The test was not as easy as it might have been for Paul as just two weeks earlier he lost a model during a midair collision. Both aircraft were being flown in a proper manner and it was just a case of being in the wrong place at the wrong time for both of them. Bob Nash the other member involved was also unable to repair the damage and both models were written off. Thankfully an unusual occurrence. Minutes of the AGM and request for club fees for 2004 will be in the post this week. Keith and Martyn Webster have been in touch from Blackpool and they are hoping the visit the field next Sunday 7th December. Hope you make it Keith it will be good to chat about the times when the cold did not matter too much. May I also congratulate Matthew on winning the GBRCAA National League Championship - Master Class and he will, all being well be flying the FAI schedule next year. i. To agree the minutes of the last meeting. iv Grass cutting organisers report and discussion. v Pilot training organisers report and discussion. vi Field and equipment organisers report and discussion. membership rather than relying on signatures on forms being sought by the member. Matthew Hoyland has proposed that Committee members should be five year members. Neil Brayshaw has ask that we clarify the meaning of 'unsupervised'. Ashley Hoyland would like to propose that we split the 'unsupervised and 'Fly alone' application forms. If notices of AGM and Minutes are posted on Web site and notice board in club house do we still need to use Royal Mail. viii To analyse the Constitution and Rules of the Club in detail and propose changes as felt necessary in view of the previous discussions. ix Election of the officers of the club: Secretary, Treasurer and at least five Committee Members. Gentlemen - we have a lot to get though on this agenda and although I have no wish to stifle discussion may I ask that we keep to the point and cut all unnecessary banter. May I ask all members to read three particularly interesting articles in the October BMFA news. No I didn't write them, but they are on subjects close to my thoughts and the correspondents are much better at communicating this information than me. The articles are:- "Chacksfield Chat" by Mike Goldby, on page 2, "TX Antennas" by Dave McQue on page 6, and "Achievement Scheme News" by Chris Bromley on page 18. The agenda for the AGM will be posted shortly. If any member has an item they wish to add to the agenda, please let me know by the end of October. As many members will know, our club house was attacked with gas cutting equipment over the night of Friday 29 August. The doors suffered heavy damage and we lost our generator. I understand that Rob contacted the police and Neil gave a statement. I also understand that Rob purchased a lock to temporally secure the doors. Eddie soon made arrangements to make good the damage and Peter Booth although not required, agreed to be available on Monday to help . By Monday evening the majority of the work was completed. The rest of the work will be attended to as soon as possible but at least the doors are lockable again. We should thank all those involved for this urgent action. Please forgive me if I have missed anyone's name who helped to get things back to normal. Thirteen members were present four models for inspection. There was some good discussion. Mr Mike Redmond, a local businessman had been invited to the meeting to explain his venture into supplying fuel to clubs. His talk was interesting and I hope he got the feedback from the members he wanted. He explained that he was setting up a distribution system to sell fuel to clubs, not particularly low price fuel but high quality and eventually it would be delivered to club flying sites with some possible financial gain to the club as a discount/donation to the club. I have Mike’s telephone number if anyone wants it. We will see how it develops. More information see www. aurora@btinternet.com rota started on Sunday 22 March. Much appreciated by those flying on that day. 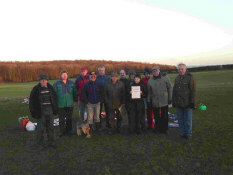 At the committee meeting of the 17 March 2003, it was made clear that when a new member achieved their ‘A’ certificate that did not allow them to fly unsupervised at the field. They are still required to have a full compliment of committee members signatures on the ‘Application to Fly Unsupervised’ form before doing so, and being issued with a key to the field. An ‘A’ certificate must be obtained before completing the form. It was agreed that pertinent questions to ‘A’ certificate applicants applying to our club over and above those required for the ‘A’ test were in order, although they would be the basis for discussion and not be part of the actual test. Any concerns would then be left with the committee for consideration when the application to fly unsupervised is made. We also defined the implications of flying unsupervised and it was said the ideally a member supervising another pilot should stand by that pilot ready to take over control at any time, this means that supervisor must be able to fly on the same transmitter mode as the probationary pilot. The discussion that followed highlighted the problem of say five unsupervised pilots requiring supervision through 3 or four flights a day. (Is it unreasonable for them to expect that if they are learning to fly?). The discussion will continue as no final conclusions were forthcoming. Later: After further discussion the ‘supervision rule’ was applied at the field on Sunday the 23 March and although some six pilots needed some supervision it was handled well and should form the basis of future arrangements. We have received the first estimate to lay a track down the field. It is such that we seeking more estimates. From the Committee meeting 13.01.2003. Three new sets of keys are required which have been acquired by Bob Nash. Brian Howard agreed to set up a grass cutting rota and membership details have been supplied to Brian. Peter Lewis and Eddie Kinman have agreed to complete any training required for the correct use of the mower for members prior to cutting the grass for the first time. Eddie Kinman agreed to take on responsibility for hardware at the club including Mower/Generator/Club House/Gate/Oil. Neil Brayshaw would continue to bring the petrol and co-ordinate the catering. Flight training would be under the guidance of Roy Durman. A new 'Application for Membership' form has been agreed and is now in use. We have agreement for a limited hard track down the side of the hedgerow to make access easier and stop cars from the need to widen the track down the field to gain traction. Can anyone help with the procurement of several loads of highway scrapings. We will then need a working party to establish the track. There are provisional arrangements to have a Barbecue on the 18th May. We agreed to register as Club Trainers: Roy Durman, Peter Lewis, John Gordon and Chris Anderson. Don't forget the next club meeting on the 16 September. Bring all those new projects and those not so new for us to discuss. Nice to see Eddie building again, a Mick Reeves Hurricane is under construction with Eddie determined as ever to make it look right. We eagerly await Tim's 'Bravo 303' and Paul's new aerobatic job which may bring some light relief after their Tucano project, which really looked the part, but a sick engine on is first take off run prematurely ended what promised to be a long awaited maiden flight. Bob has entered the aerobatic scene with a Home Run which looks very promising after its first flight yesterday. Pete made serious steps towards finding out what competition aerobatics are all about with his Flair Swallow and SC 91 four stroke. Peter's support at the recent aerobatic comps has been appreciated and he spent some time scribing for the judges at the Nationals - volunteers are always hard to find. It was good to see so many club members attend the Nationals - over the three days I think I met up with 16 members. I hope they have all came away inspired and got stuck into that new project. Close inspection of Ian Richardson's F-100D was one of the highlights for me, even more amazing, it is reported that it took only 5 weeks (of long days) to complete. After our lack of knowledge of YS engines initially caused a few problems but Matt's Majestic has performed well through practice and the comps since then. Only miner problems to sort, one being the strength of ZN undercarriage legs and the other exhaust couplings. Matt took second place in Senior Class aerobatics at the Nats, being beaten by just 6 raw points, I was 5th in Standard, but we both managed promotion scores. Matt proved that you don't need a Majestic at the recent comp at Skelbrooke, he flew his MK Alliance (YS 63) to second place and gaining his required promotion points to fly Masters next year. Please send us any points you wish to include in these news bulletins. Friend of the club and previous club secretary has supplied some used 12v and 1.5 volt rechargeable cells rated at 250ma. Please let me know if you are interested, first come first served. All will be pleased to know that the lawn mower is now performing well, but care must be taken not to over rev the engine, as it still needs final adjustment. Beware, the speed can induce jet lag if you spend much time cutting. Congratulations to Andy on achieving his 'A' proficiency certificate. Nice to see Roy flying his Dave Smith Smart Move with OS 70FS. Any photographs Roy? Matt has progressed into Senior Class in F3A with his Majestic (pics elsewhere on the site) with two second places in his first two comps. I remain in standard class with again two second places, however a poor entry into a spin lost me first place on the last manoeuvre on the last flight. All members (without exception) have renewed their membership, and information has been passed to the BMFA. As soon as the certificates arrive I will post those to members who have sent stamped addressed envelopes and the rest will be handed to members when I see them. So membership is as last year with the addition of 4 new members and 2 others waiting to join. (Including three junior BMFA members). The rent has been paid for 2002. At the field, same as every where else I suppose, cold - wind - rain - mud, plenty of conversation ,tea and coffee every Sunday and still some flying most weeks. The mower has been returned but not tested yet. I think we are all looking forward to better flying weather and the emergence of some new projects, any news would be welcome but Neil and Eddies decision on new scale projects are eagerly awaited, Roy’s entry into 60T/90F aerobatics with a Dave Smith design, Matt’s ZN Line Majestic both not yet finished, and Bob has something on the building board, but these are all I know about there must be others. Any more news please let me know. No increase in fees for this year. The lawnmower has been given a good bill of health by the service agent and we are now awaiting its return. Cost was well within estimate. Membership is up on last year - 28 members with 3 juniors. Meeting Dates for this year are:- 21 January, 18 March, 20 May, 15 July, 16 September, 18 November (AGM). A reminder to all that the next meeting is on Monday evening. The next meeting will be in November and this will be the AGM, please be there! Nice to see Keith Barker at the field again, unfortunate that the weather did not encourage a first flight for three years. News from the British Nationals. Matt won the standard schedule with Simon Johnson winning the Senior and Richard Howarth from Doncaster winning the Masters. Six flights were made over the three days. (Click here for pics of Ashbourne comp, British Nationals and the F3A World Championships 2001, Cork, Ireland). Sorry for the delay of this entry, hols and things! Matt got another second in standard at his third comp at Ashbourne. Lucky really as since then we have had to clear foreign matter from the fuel system 'O' ring and the back bearing collapsed last Sunday, so two new bearings, but not bad after twelve months of reliable flying. It is good to see Bobs new model flying so well. Nice sight to see it settled on the landing approach with full flap. There were nine members at the bi-monthly meeting. 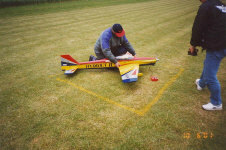 Bob brought his repaired Havard fuz, looks in good shape and he says the wing is almost ready to fly. Brian Passmore brought his half finished Sea Fury, beautiful planked fuselage and light in weight but still lots of problems to overcome, keep at it Brian. Matt brought his almost finished Loaded Dice III and the fuz for our/his next project. Nice to see Tim and Paul make it this time. Congratulations to Paul Dack under the guidance of Norman his Grandfather and a couple of club members on achieving a first successful flight with his first training aircraft. Any photos? Next meeting is 17th September then 19th November which will also be the ANNUAL GENERAL MEETING at the Lordens Hotel, Doe Quarry Lane, Dinnington.. What do you think about next year? What are we going to do about the members who never cut the runways. I suppose this is one for the AGM on the 19th November at the Lordens Hotel. One suggestion is that we double the fees for those who do not want to use the mower, however consideration must be made for some, and forged doctors notes are one thing, but notes on scrappy bits of paper from Parents will be viewed suspiciously. Hope to see you at the Nats but do stay to see the evening free flight and indoor flying in the hanger, arrange to be home late. Incidentally the problem with my Redshift, reported after the last comp, turned out to be the fuel pin in the IFM unit sitting too far into the 'O' ring making it difficult, and eventually impossible for the diaphragm to open the fuel feed on demand from the exhaust pressure. The solution was to move the diaphragm half a millimetre further up the fuel pin. The best of faults, it cost nothing a bit of time to sort out. Matt did it again on Sunday at Skelbrooke. Came 2nd in standard, this time beating the winner of the last comp by half of one point. and getting promotion points to fly the Senior schedule next year. I was dogged with engine cuts; best excuse I could find. Thanks to Peter for his support on a cold and very windy day. Has bob any news about the University Challenge? Anyone else with news please let us know. PS. Hope to bring to the next club meeting the most beautiful fuselage I have ever seen, if Matt will let me - watch this space! The club monitor was returned to Mainlink at Sandown for adjustment. We had to replace the battery but we were in the right place to find one at the right price: 8.4v 2 amp at just under £14.00. Initial tests suggest that it might give better results, but we will see. Ten members gathered last evening at the May club meeting. Lively conversation all through the meeting on several subjects. It was good to see Bob in good spirits after his accident. Roy Durman agreed to replace the first aid kit with items more suitable to big engine damage. Matt brought along his half built, 2 metre Loaded Dice III, OS140RX with OS pipe. Next meeting is the 16 July - hope to see you then. Congratulations to Kevin on achieving his first flight with his kit built Piper Cub, Irvine 40. I understand the first flights were made using a buddy box lead. A first for the club I think. It was nice to see John Harris with his new Pitts, Super Tigre 3000 being run up on the field. Hope I see the first flight John. Another new model to take to the air recently was Neil's new Bar Fly, Well used Irvine 40 still going well. Flys fast and no doubt it will be as reliable as its predecessor. Congratulations to Matthew on achieving second place in his first Standard aerobatic competition at Mansfield club field this weekend. Promotion points for the senior schedule were also gained, pretty good for a first comp, father was a little further down the list. We had real problems getting airborne from the runway due to length of grass, which made us appreciate the condition of our runway. There was a total of nineteen entries with seven in standard. The winner of standard was flying a 2 metre Hydeout II (Chip Hyde design, See pic below) but Matthew's G-MACH performed well against the slow 2 metre models. It was so impressed not only the way Matthew flew against the big boys but also how the Redshift performed outside its design envelope. It was designed for turning 11 x 7 props at 14250 rpm, now it is turning an APC 11 x 11 at just over 10000 and coping very well. I was very proud of them both. Twelve members enjoyed the meeting on Monday. Four models were brought to encourage discussion. The centre of attention was a incidence metre made by Roy Durman which created many thoughts when it was applied to the models. Our BMFA contact announced that he felt it was not good use of the clubs funds to attend further meetings at Leeds. The main aims of the Northern Committee was to provide facilities for those who needed help to organise flying sites. The mower is almost complete and ready for the new season. Bob Nash also brought us up to date with the new peg board which again should be in use very shortly. Eddie Kinman said he would repair the security door on the club house, two or three of the hinges have become detached and need welding back into place. Next meeting 21 May 2001. Many telephone calls have been made today to make sure the field is usable without causing concern for Foot and Mouth. It is open as usual but we must keep clear of the public footpath. However all members must take responsibility for their individual circumstances. Don't forget the next meeting. 19th March - further meetings 21st May, 16th July, 17th September, 19th November. Perhaps Peter will report on his BMFA Northern Meeting and where we go from here. What news on the lawn mower. What action should we take on the security door on the club house - anyone noticed! What about the mains lighting? - thank you Roy for the free fittings. More news on the Pegboard from Bob. We have 27 names on the books so far this year with 5 potential members in the wings. Get those bits of model together and bring it with you. I hope to bring the Excelsior again but finished this time. Bob and Ashley attended the lecture advertised below. The opening sequence at the lecture was of the official run to brake the sound barrier with SSC. It was impressive on the large screen and begged the question "what do we do next?" - the bang put shivers up my spine - worth going just for that! Richard Noble and his small team intend to set up a Internet booked air taxi service and expect some 16000 aircraft will be needed in the first nine years then 2000 a year after that. North America and hopefully Europe will be targeted operating areas. Their unique wing airfoil section is the secret to the short field operation whilst offering 340K cruise for four passengers in a comfortable, quiet, club class type cabin . Thirteen members enjoyed an evening together at the second club meeting and elsewhere on this site you will see Chris's pictures of the models. Peter was elected the club BMFA contact and has since attended the Northern area meeting in Leeds and we would suggest that you talk to him for further details. Visitors to the clubhouse will know that the repairs to the mower are well under way and there are plans to install some 240v fluorescent light fittings to full advantage of the generator. North Anston Society of Aeromodellers has now been added to the club links page of the BMFA website. The BMFA fees remain the same as last year so ours will not change as agreed at the AGM. Fees need to be paid by 07 01 2001. Notification will be sent through the post to all members (unless I see you on Sunday 03 12 2000) over the next few days along with a reminder about the next club meeting. The first club meeting on the evening of Monday 20th was a success with twelve members present. Three models were brought for discussion. The landlord took an interest in our activities as he remembers sitting in the field watching us fly from a distance. Another convert. It was agreed that bi-monthly meetings would now take place on the third Monday of the month. The next meeting will therefore be at 8.00pm on Monday 15 January 2001. Hope to see you there. Bring a model or anything of interest! Each member will be notified of this decision though the post when the fee notifications are sent out as soon as BMFA fees are known. Any comments please use the discussion page on this site.